As a knitter, as in life, when something is working well, it can be hard to take the time and effort to try something completely new. Doing something for the first time can be exciting, but it can also be so much harder. I have a really hard time breaking my strong habits, especially when deciding which direction a garment should be knit in. 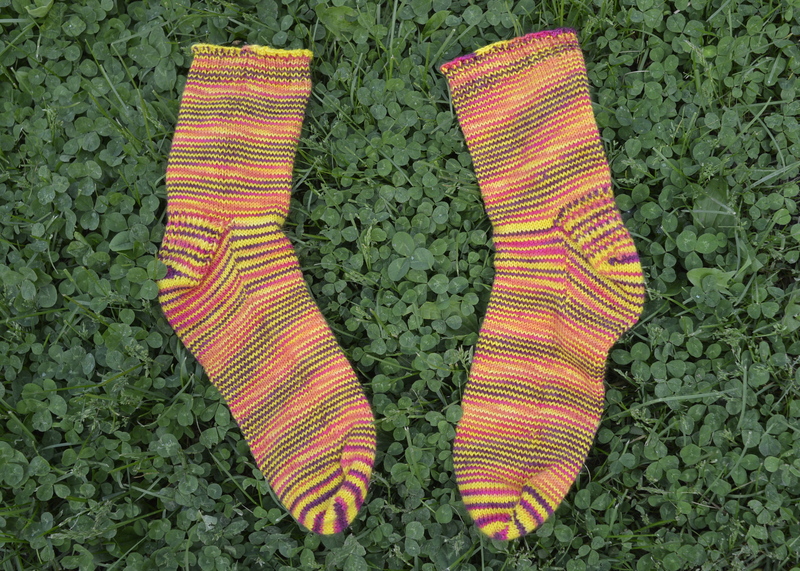 My very first pair of knit socks were toe-up, provisional cast on socks that I knit in a class at my LYS, and I was hooked. Imagine my glee when I discovered Wendy Johnson’s Socks from the Toe-Up. 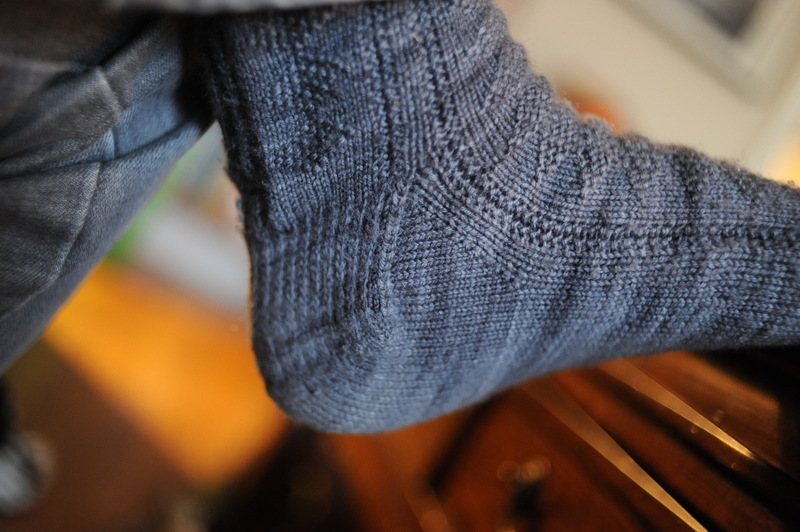 The book has lace, gansey and cabled variations of the toe-up sock, with lots of clear instructions on the required techniques. For creating the toe, I have always used a provisional cast-on with a crochet hook (demonstrated in this video) to create a short row toe. The technique is really simple and doesn’t require much in the way of extra needles of notions, the way a Turkish cast-on does. 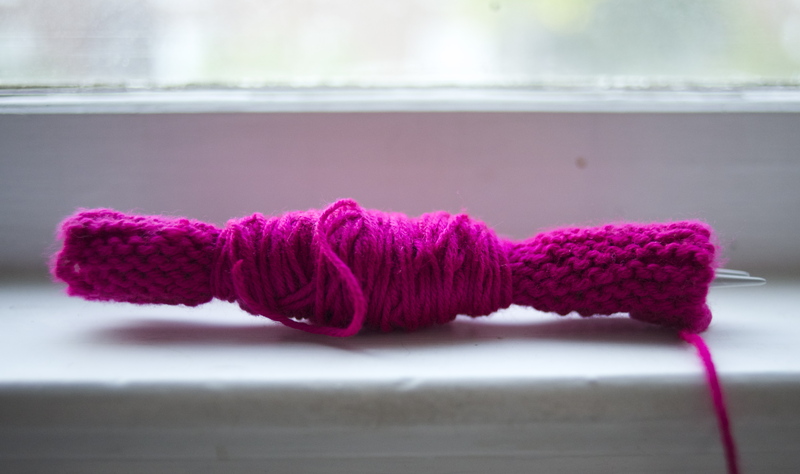 You use scrap yarn to cast on a temporary row. After working short rows around into what my son labelled a little hat, you remove your scrap yarn to reveal live stitches, and begin knitting in the round across both sides. 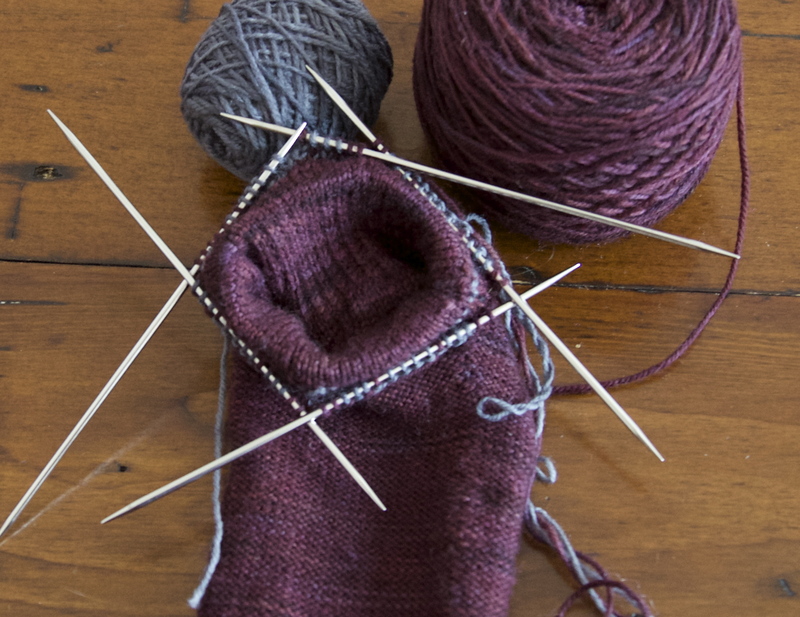 This method is also really easy to modify, if you want to add additional stitches to a sock, simply work the toe until a little less than a third of the toe stitches are wrapped on either side. 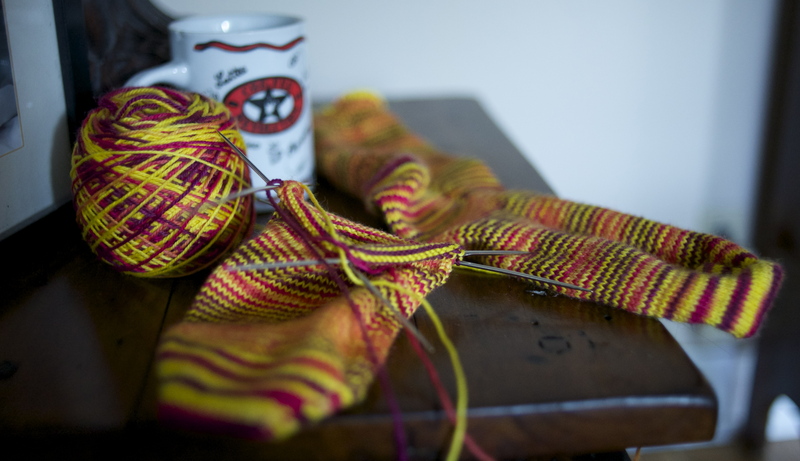 There are no end to textures or patterns you can use on socks, and I’ve done a lot of experimenting with a variety of patterns, although teeny tiny cables tend to cause more than their share of slipped stitches and split yarn. When it comes to toe-up heels – I’ve tried three varieties of heels, and each one has it’s benefits and costs. All three are outlined in the book, and there are examples of each in the free patterns available on Wendy Johnson’s blog. There are short row heels, which are worked in essentially the exact same way as the toe. 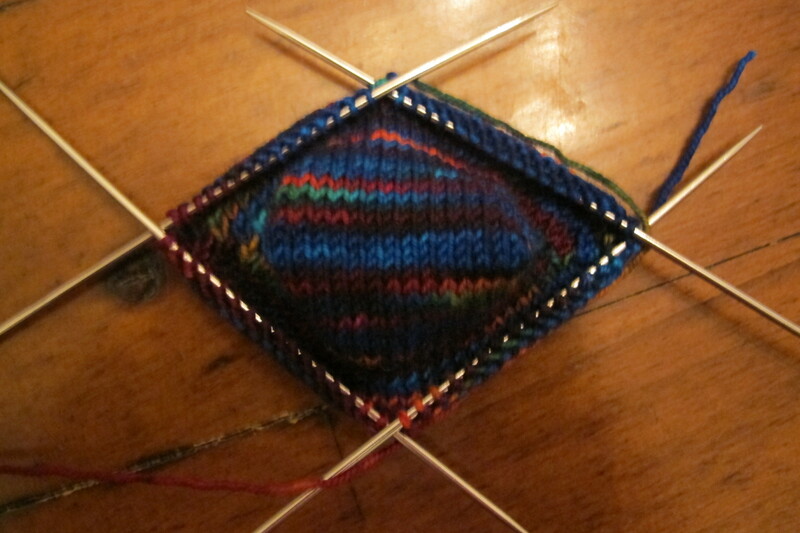 They are quick and easy and look a lot like commercially produced socks (if you’re into that). I have used them for thick, wooly camp socks like the one below. 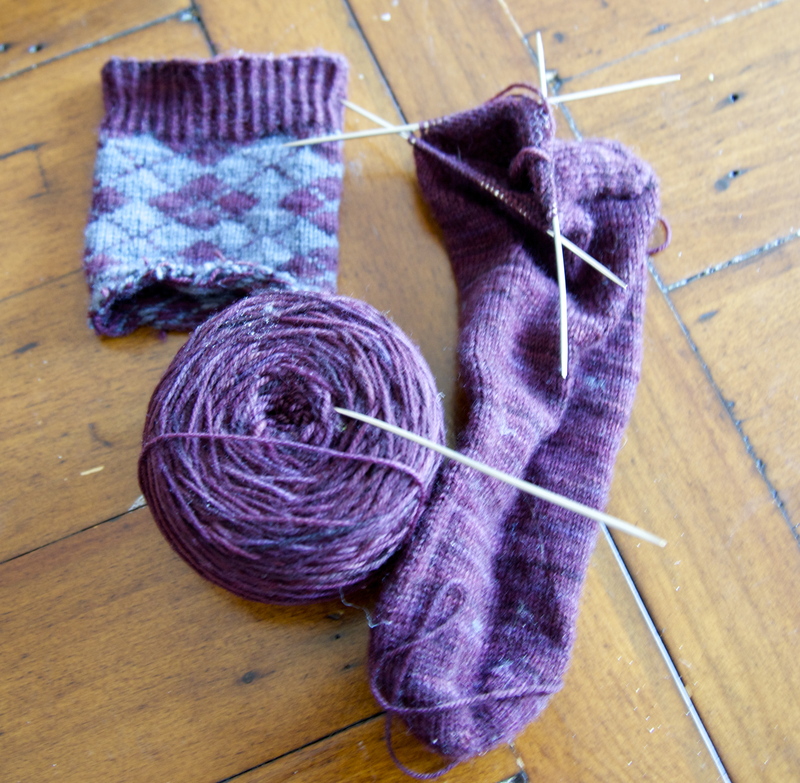 However, on finer socks (knit on size 0, 1 or 2 needles) they don’t really provide adequate space across the top and give socks a funny look (as happened a few years ago, with my first lace socks, which were too ugly to photograph). Gusset heels provide a lot more space across the top of the foot, since they are created by increasing incrementally, and then knitting a flap up the back of the foot. They are flat, easy and attractive, but wear out a lot faster than other varieties. 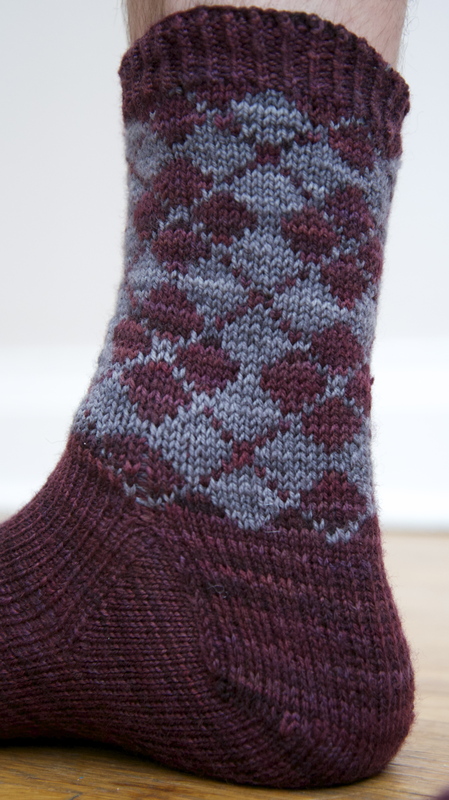 If you are making lacy socks that are unlikely to experience hard wear they’re a great choice. 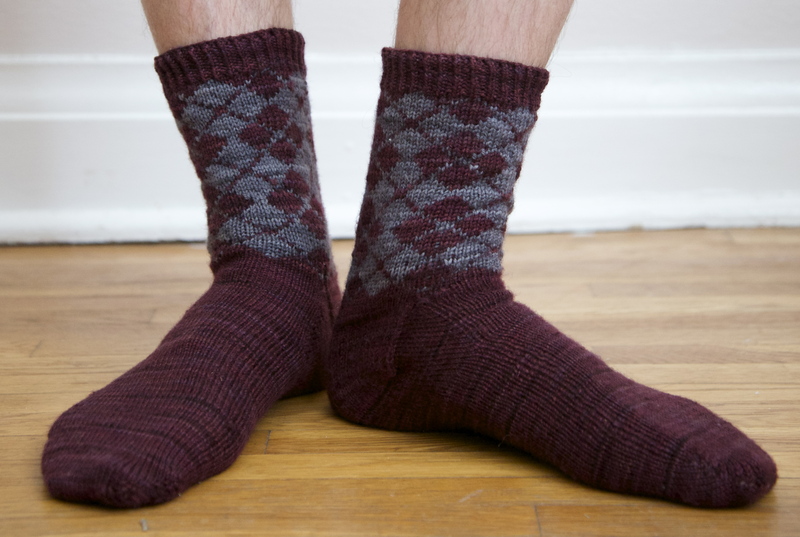 However, my husband has worn out multiple pairs of handknit work socks made with gusset heels. 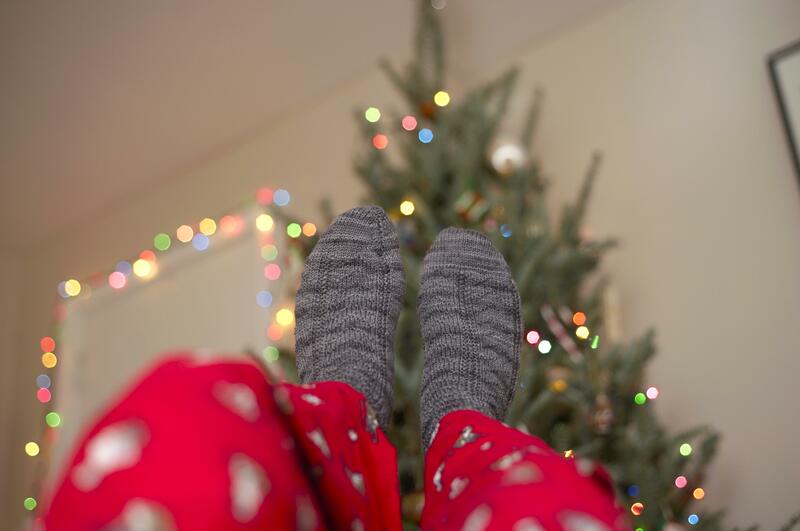 Choosing a slip stitch heel appears to prolong the life of a sock significantly, and when you’re investing a couple weeks and some good yarn, you want those socks to be loved for years. A word of warning though, these heels take more time and attention and are far less forgiving. I lost track of which stitches I was slipping on my first slip stitch heel and the lovely ridges staggered raggedly up the back of my husband’s foot. 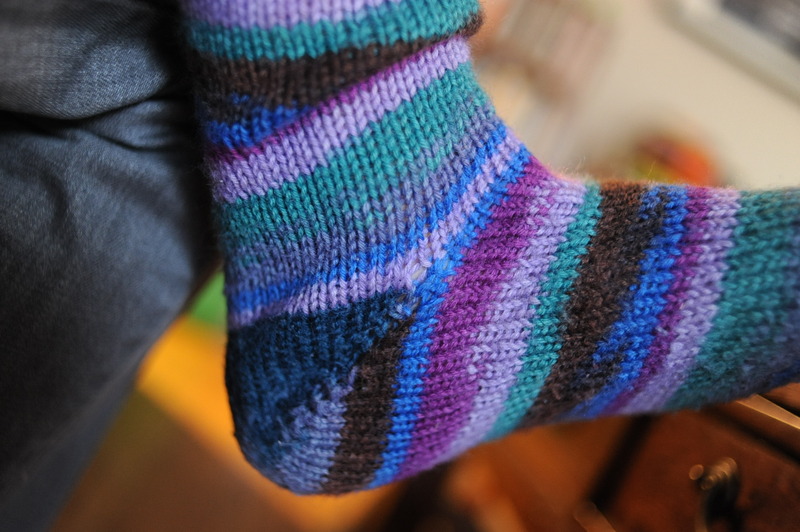 Turn off the tv and actually look at your knitting before attempting a toe-up slip stitch heel! 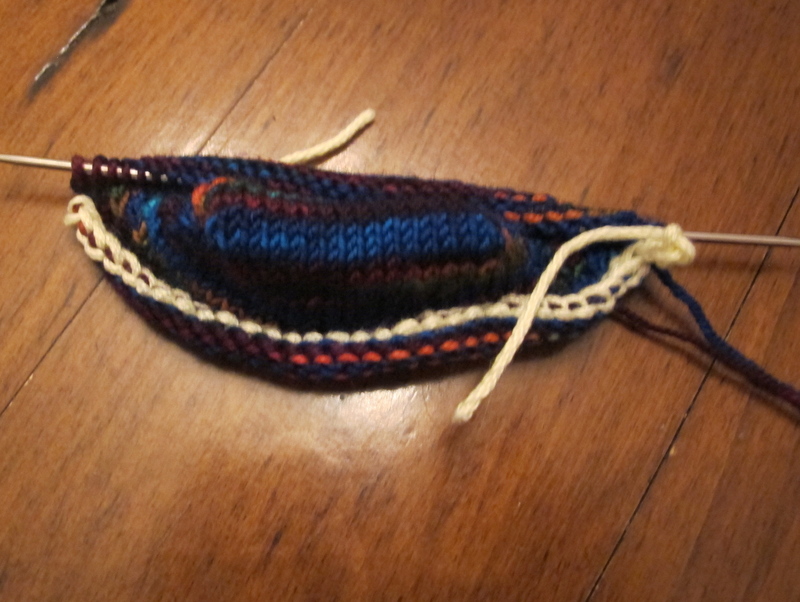 This entry was posted in Knitting, Socks and tagged knit, socks, toe-up, Wendy Johnson on November 19, 2012 by lisagono.